Brazilian artist Cícero D’Ávila has been making a name for himself as a traditional sculptor for years now. He’s managed to master the techniques of classical sculpture in the practical realm and has used ZBrush and CNC technology to take his work to new heights in the modern world, offering more precision and cutting down production time. 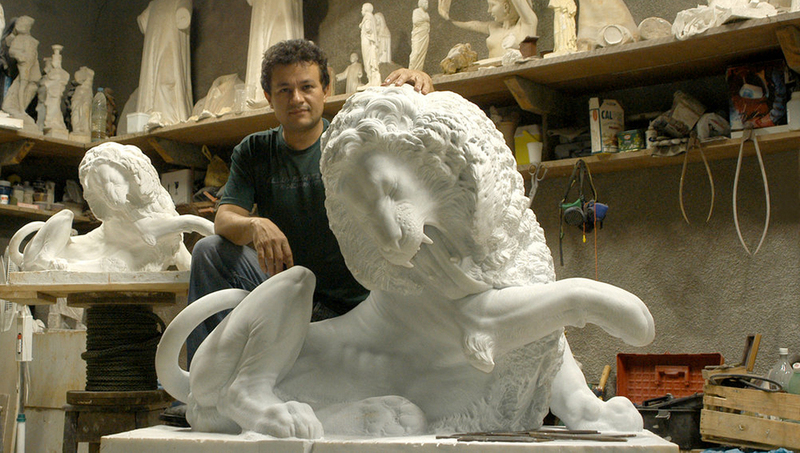 Cícero is one of an increasingly rare breed of artists still sculpting in marble, which he teaches along with bronze sculpture at his atelier in Sao Paulo. There are a number of factors that contribute to the lack of sculptors working in marble today—namely high costs, a scarcity of good marble, complicated logistics, and the demanding amount of time it takes to work with the material. The traditional process always begins with a clay modeling of the work which is to be made. Then this is passed to plaster by means of molding, and the plaster model is then used to create points on a block of marble through a point machine. This process is very precise, but very slow. My last sculpture, the Red Angel, was made this way. It’s a very large work, and consumed me for approximately two years. Nowadays there’s a technological process that can achieve the same result in much less time. It consists of scanning the model in plaster, or even modeling it with 3D software (such as ZBrush), and then milling the heaviest work on a robot. The same angel I made by hand would take about four months using this process.